Want to know why we’re NZ’s favourite kontiki? See for yourself – watch our Predator Kontiki video now. 2 Year Warranty, hand built in NZ. Powered by the leading saltwater white motor. Owned and loved by Graham Sinclair – his favourite kontiki system. From just 7.5kg plus batteries. Predator outperforms all other kontikis. 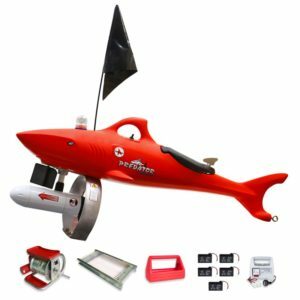 The most advanced fishing technology available. 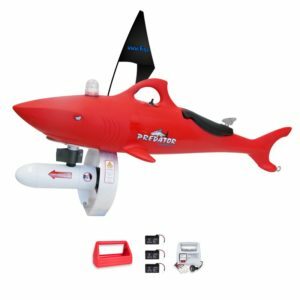 Predator’s Unique Shark Design cuts through the waves; propeller continues to pull the kontiki out to sea. Some other kontiki-type products have the propensity to bounce over the top of the waves; the propeller is out of the water so forward movement is lost. We reckon about 2 seconds is long enough to wait before sending your fishing kontiki out to sea. Other kontiki-type products can take more than 15 minutes to get a satellite fix. 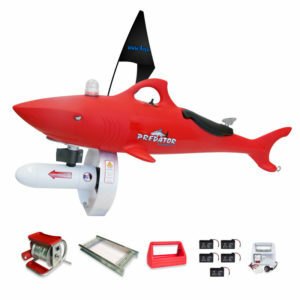 Catch yourself a real family fishing experience with the Predator Fishing Kontiki when you go out to the beach this summer. Built by Fishtex, the Predator is New Zealand’s favourite electric long line fishing kontiki. 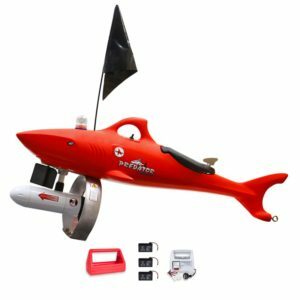 Using nature’s design, the Predator shape is designed to sit low in the water to drive under the breaking surf to avoid being put off course. Our kontiki will handle most beach conditions, so you can use it on calm days and in rougher seas. It’s easy to use single-handed or with friends and family with its smart design and 2-second AutoNav setup. The automatic Kontiki Predator is an easy to carry kontiki with great looks and offering the best performance. With auto navigation it offers 2-second point and go setup – just point the kontiki in the desired direction, set your course and go. Whether you’re fishing on 90 mile beach or somewhere off the southern coast, you can make the most of your favourite kontiki fishing spots and reel in your catch with ease. There’s plenty of fish in our New Zealand waters and some great kontiki fishing to be had. This is a NZ made kontiki so you can buy with certainty knowing you will be well looked after with fishing gear that is built for New Zealand conditions. Some other kontiki-type products have a tendency to bounce over the top of the waves; the propeller comes out of the water, so forward movement is lost.